New engines for Audi A4 and A5 | What Car? Audi has added new engines to the A4 and A5 ranges. The A4 saloon and estate now has a third 2.0-litre diesel. Buyers can choose a 168bhp version alongside the existing 118bhp and 141bhp engines. 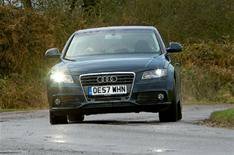 Like the less powerful versions, the new engine features common-rail technology, which What Car?s road testers have found greatly improves refinement compared with the previous generation of Audi diesels. Performance and economy are both impressive, sending the A4 saloon from 0-62mph in 8.3 seconds while delivering 53.3mpg on the combined cycle. Carbon dioxide emissions of 140g/km place the car in the 19% company car tax bracket. Prices start from 24,600. The Audi A5 also has a new engine. The 2.0 TFSI engine replaces the 1.8 TFSI at the bottom of the range. Power is up 10bhp to 178bhp. The 0-62mph sprint drops 0.6 seconds to 7.8 seconds, combined mpg improves 3mpg to 42.8mpg, and carbon dioxide emissions drop 15g/km to 154g/km. This puts the car in the 19% tax bracket. The car is available to order now, with prices starting from 26,710. However, deliveries wont start until January 2009.